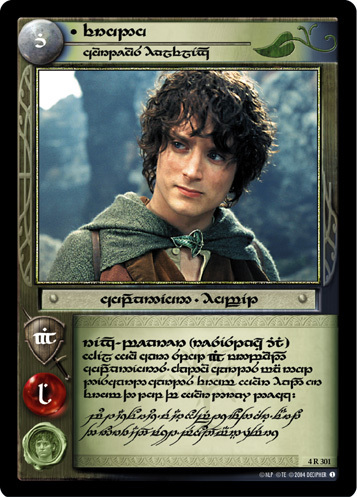 But let's be fair - CCGs just don't have the options for fancy game parts that RPGs do. (For instance, D&D had a limited run of DM screens - my local DM has one, and it's impressive as all heck.) And while t-shirts and bags are neat (my Ambassador bag has held up wonderfully over the years), they're not exactly common. 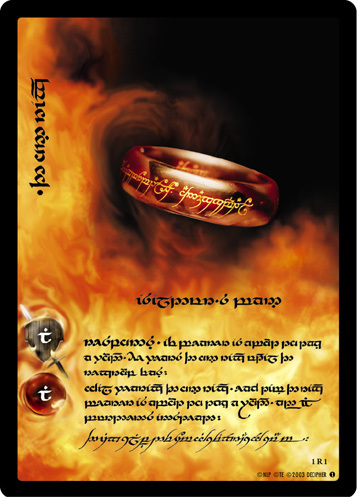 Decipher, for various promos, would reprint cards in Tengwar (the script that the One Ring is in). And the images I found here do not to the real ones justice. They just look awesome. Now, they're terrible to actually play with, since no-one actually reads the language (and after being away from the game for a while, you look at them and go "wha?"). But very very pretty and cool.